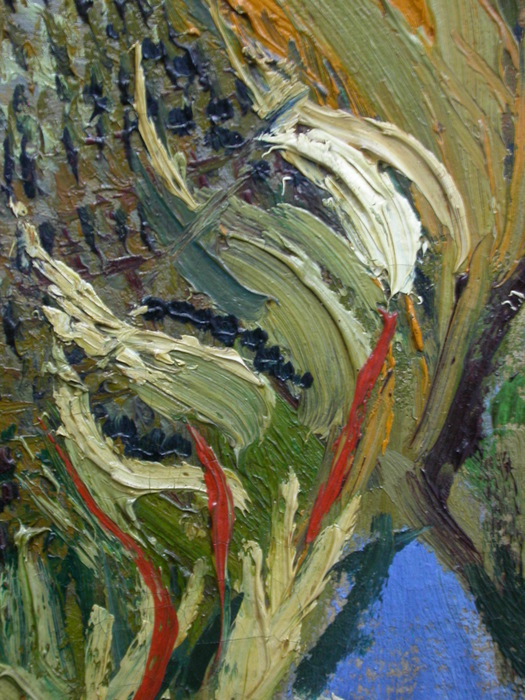 ... always having thicker paint and being somehow bolder than its contemporaries. 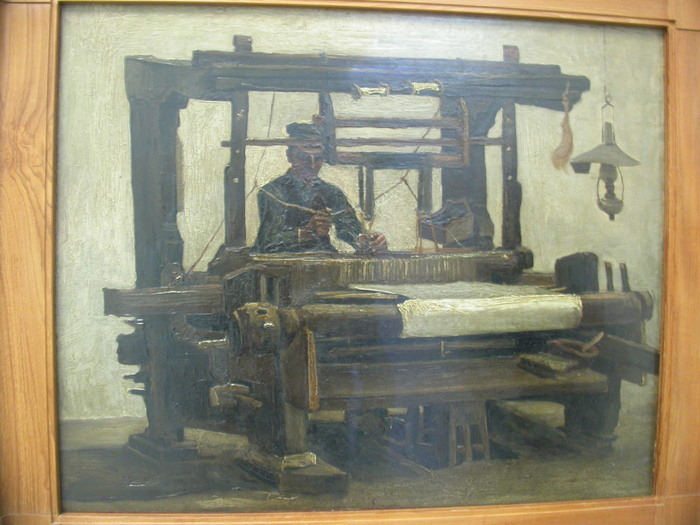 This is a bit of Weefgetouw met wever ( Loom with weaver ) from 1884. The whole painting. 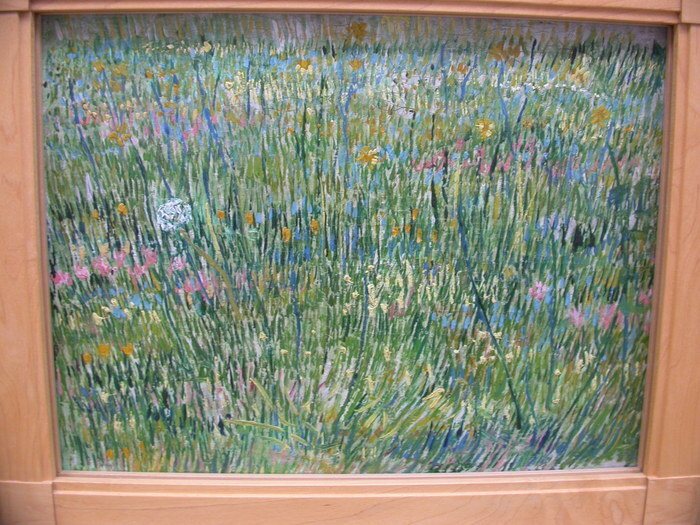 Hard to believe it's a Van Gogh from this distance. This was from roughly the same time as Het aardappeleters , The potato-eaters . Most of his works from this time are dark, and several seem to commemerate the life of the working class. 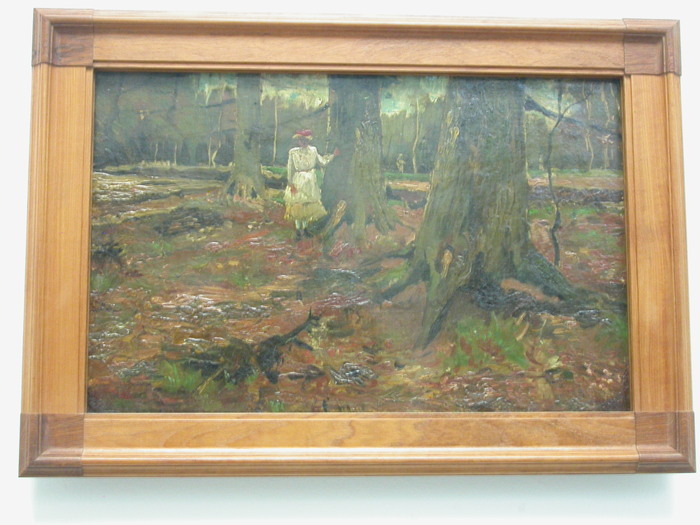 Like many museums, it is difficult to get a look at the darker pictures without glare. My shadow allows a look at this piece. It's very peaceful, somehow. 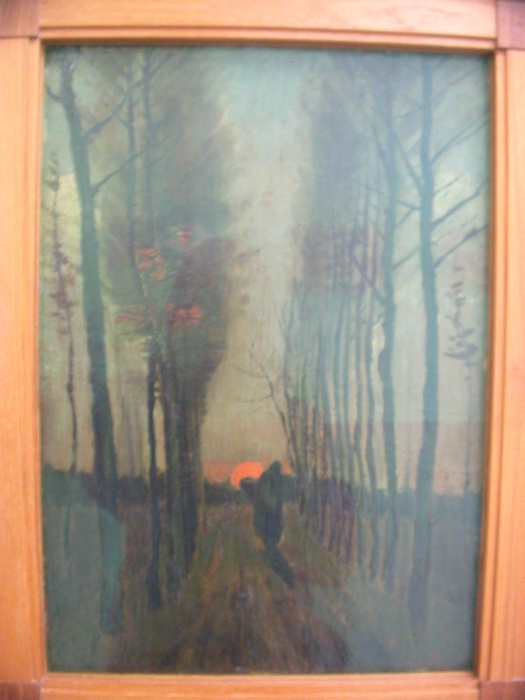 Populierenlaan bij zonsondergang , Poplar lane at sunset (1884). 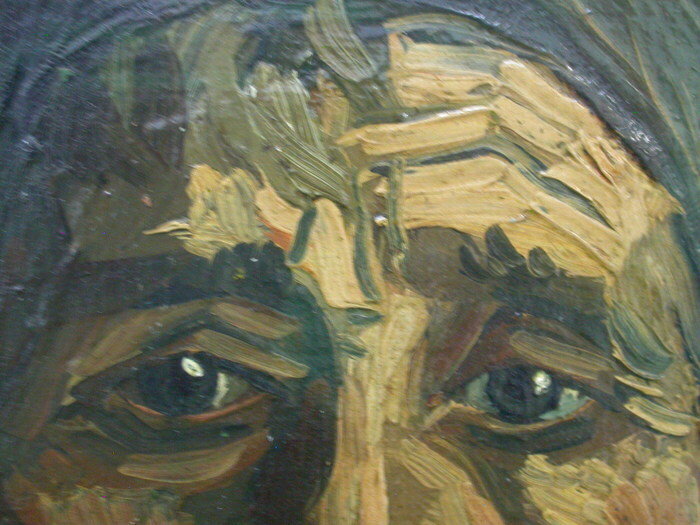 In real life, this painting was nearly entirely black, with the face seeming to assemble itself from the few strokes of lighter brown in the darkness. Everything that isn't in my shadow is in glare. 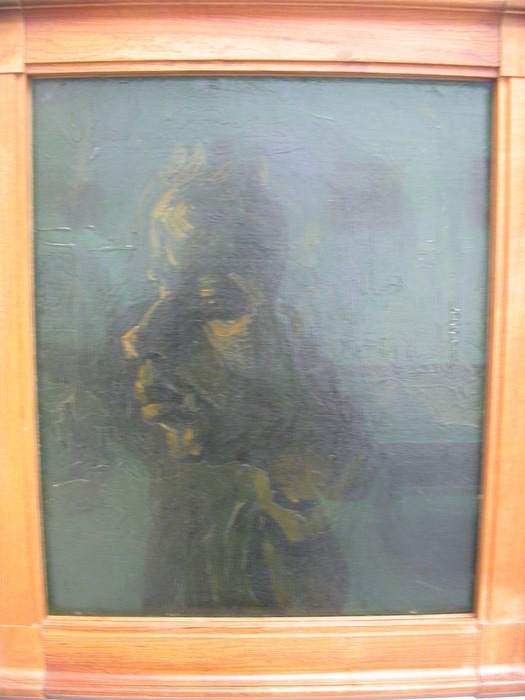 Kop van een vrouw ( Head of a woman ), 1885. 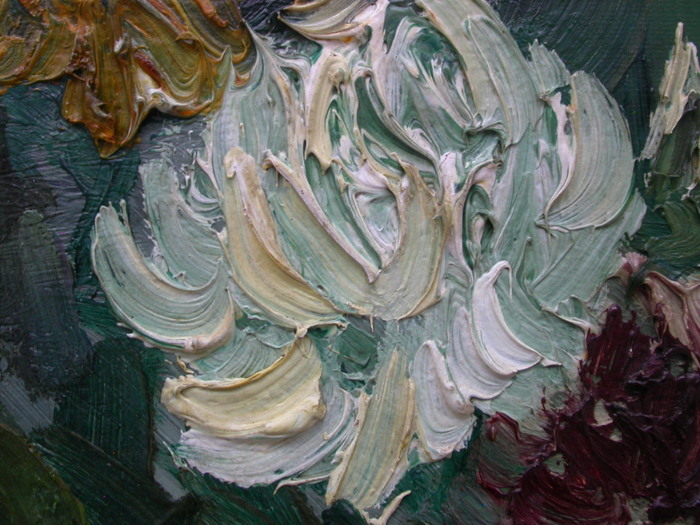 Vogelnesten , from 1885, illustrating Van Gogh's combination of texture (the paint really is standing up off the canvas) and color. 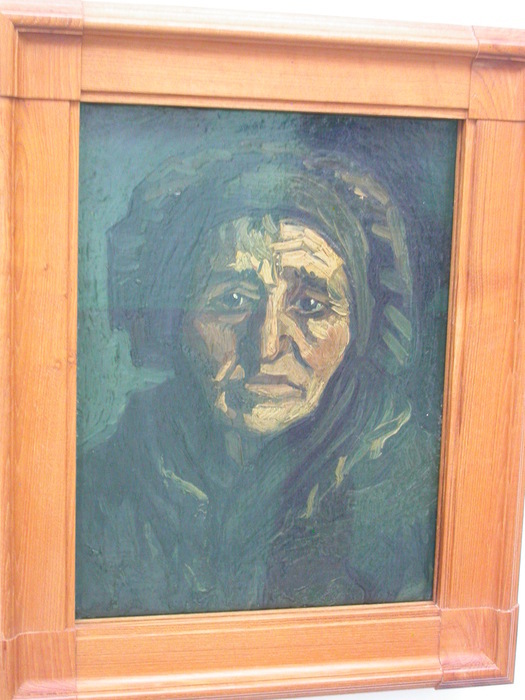 Another painting titled simply Kop van een vrouw from 1885. A close look at the forehead. It is rather impressive how few brushstrokes actually make up this image. 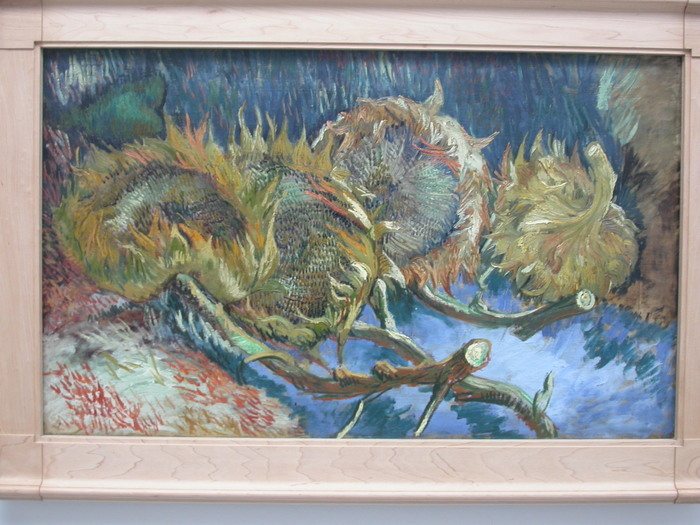 Van Gogh did lots of sunflowers. These are Vier uitgebloeiede zonnebloemen , translated as Four sunflowers gone to seed but the Dutch word translates more literally as bloomed out . 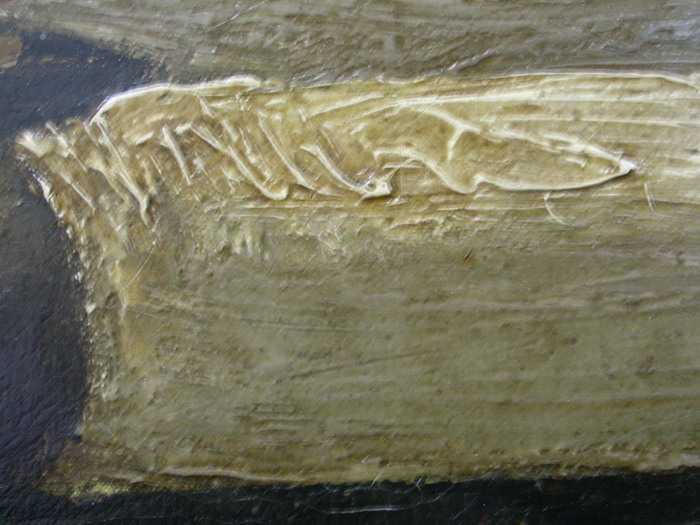 Another close look at the brushstrokes. These small areas are almost a work of art unto themselves. The center of one of the sunflowers. 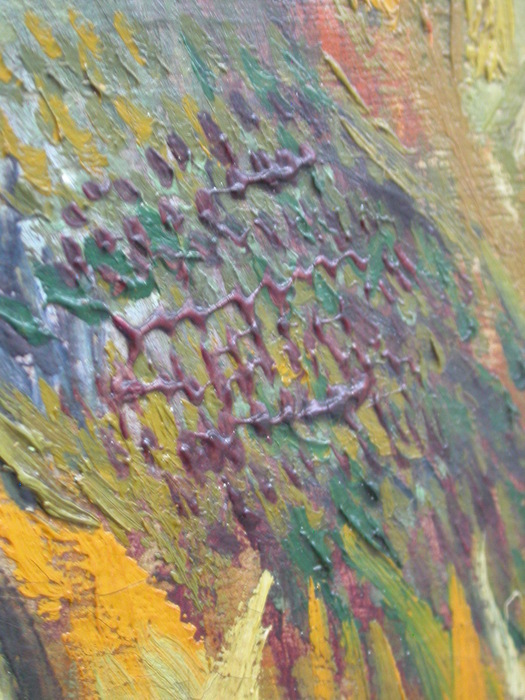 Notice the paint zigzagging like wires on the surface of the canvas. Grasgrond ( Grassland ) 1887. 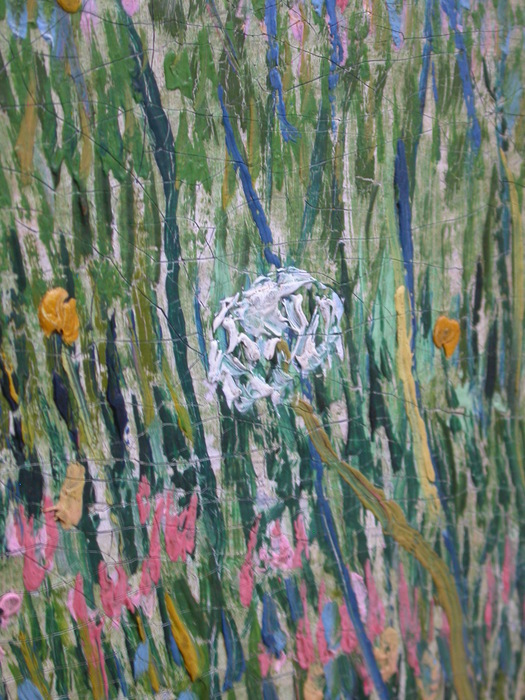 One of the weeds in the grasgrond. 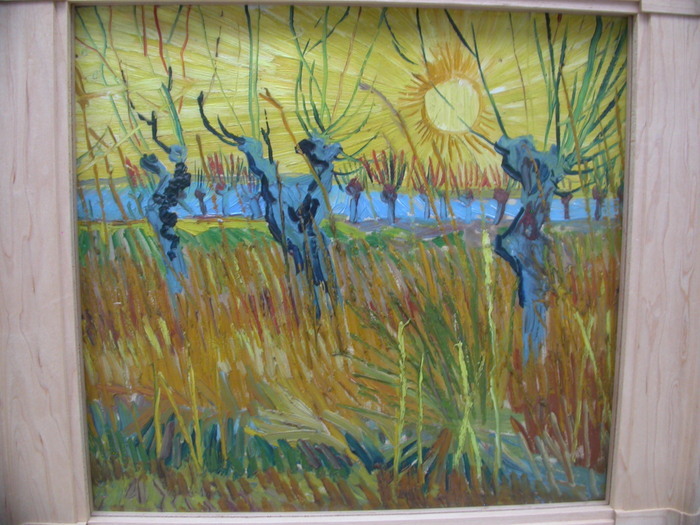 I get the feeling Van Gogh appreciated the beauty of the local swamp too. Knotwilgen bij zonsoondergang ( Pollard willows at sunset ) 1888. 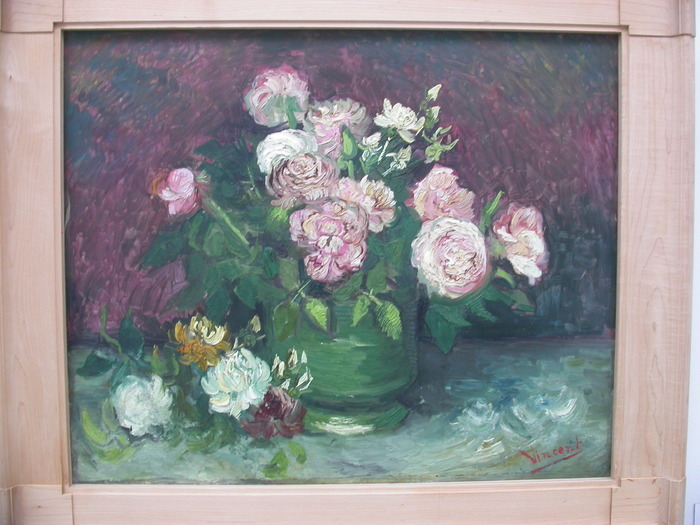 A still life with pink peonies. Only Van Gogh could make this subject worthwhile. 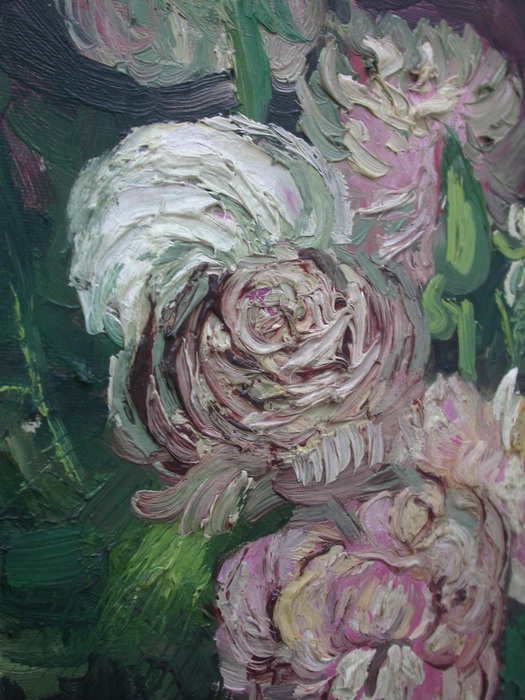 Rozen en pioenen 1886. 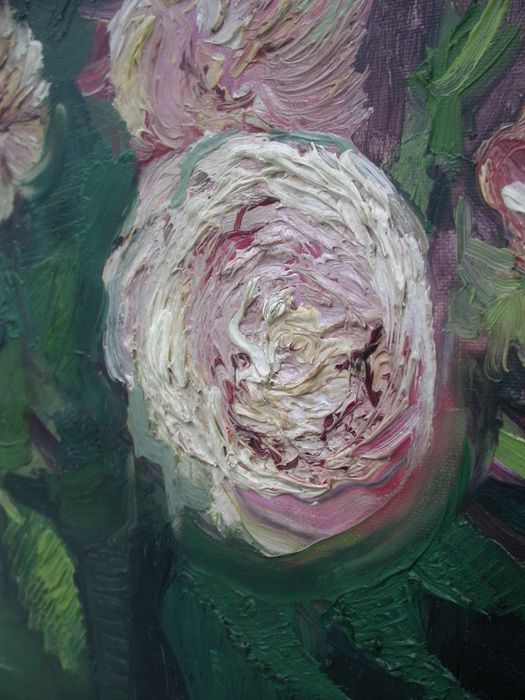 A close look at a peony. 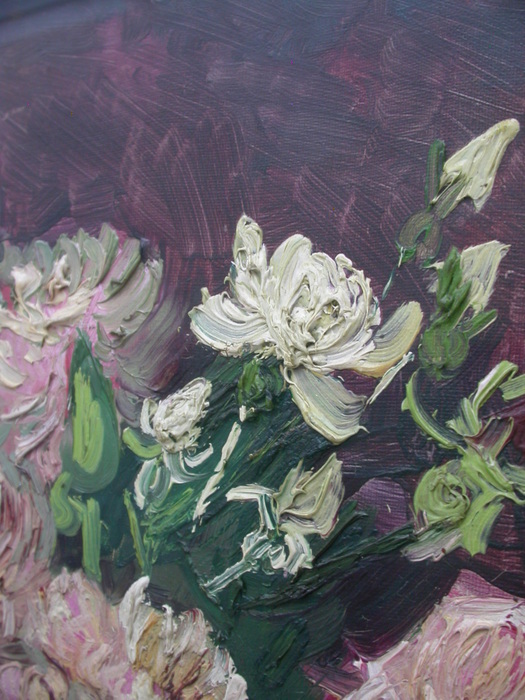 Another of the pink peonies. This is my favorite shot of all the Van Goghs. The movement in the paint is captivating all by itself, and a few strokes assemble themselves into a flower with an ease that should be admired by other impressionists. 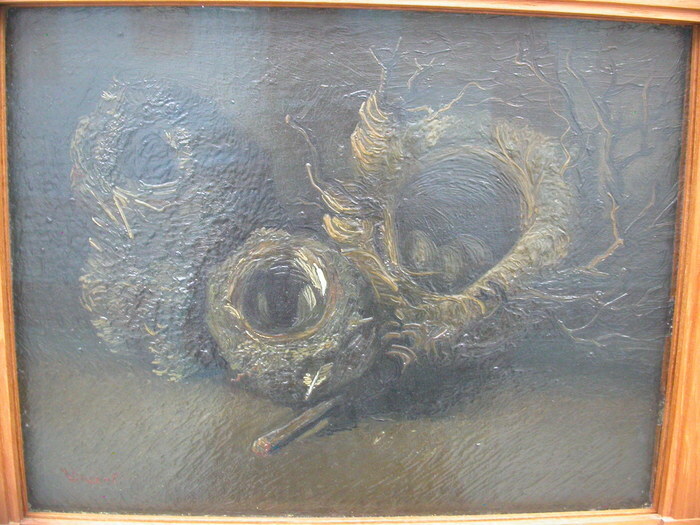 The Kröller-Müller collection was being assembled during the surrealist movement, as well. 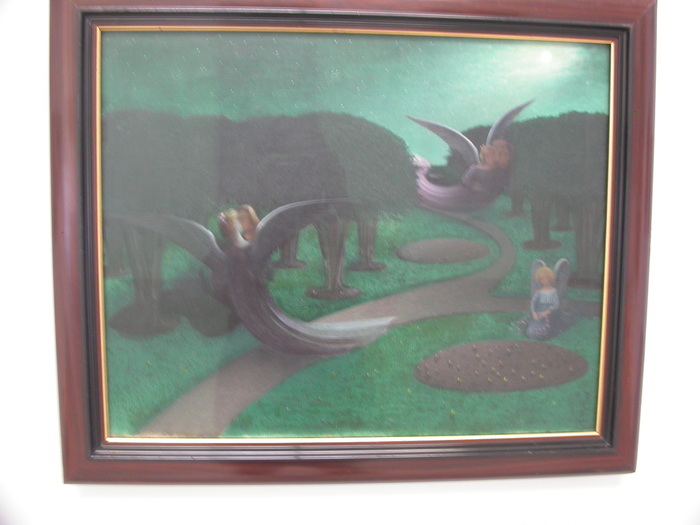 Les anges de la nuit ( The angels of the night ) is by William Degouve de Nuncques. 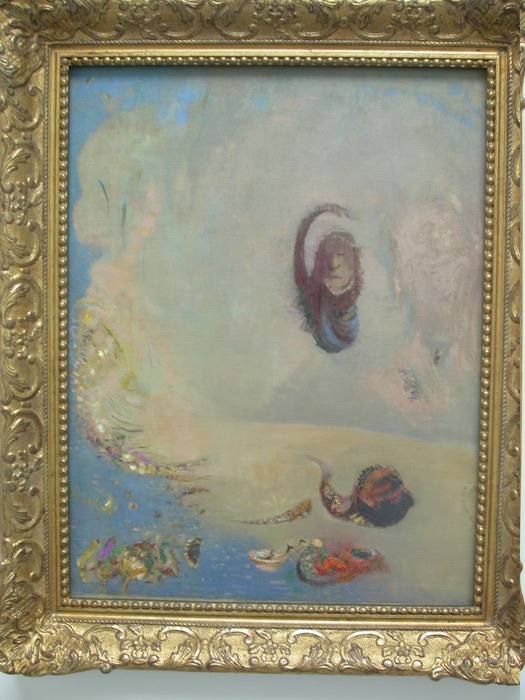 Oannès , by Odilon Redon. Wikipedia says that Onnaès is the name given by the Babylonian writer Berossus in the 3rd century BC to a mythical being who taught mankind wisdom. 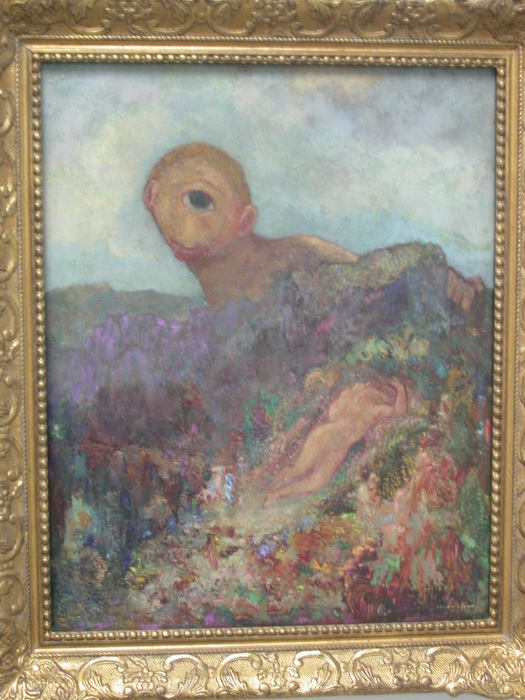 Cyclops, by the same artist. Pegasus, same artist. Somehow the piece seems to capture the mythic quality of the story, even though pegasi and other winged things have been overused in fantasy to nearly the point of meaninglessness. Another piece that I feel I shouldn't like, but I do. The piece is slightly taller than I am. 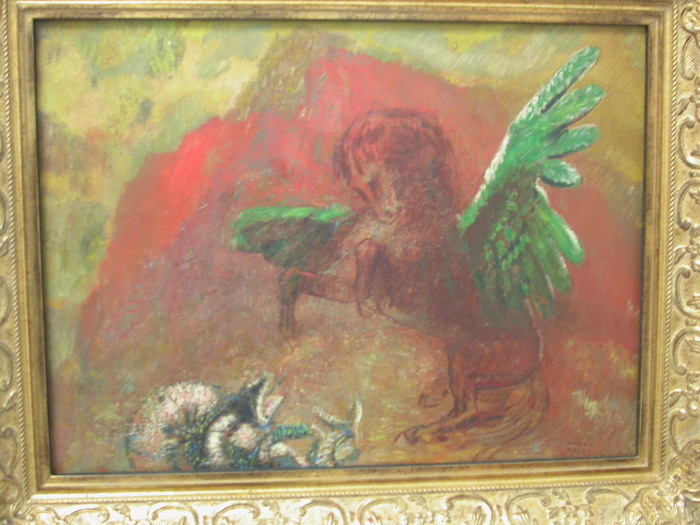 The green blob to the right contains a pegasus. 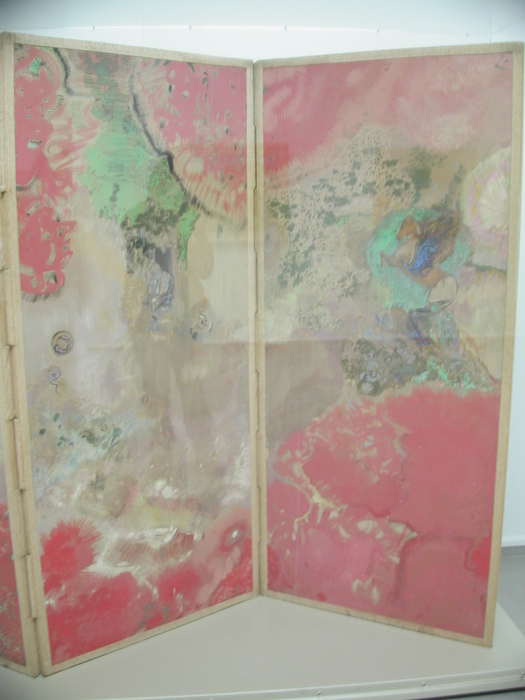 There is the suggestion of clouds and planets in the rest of the piece. Like the previous pegasus, it somehow captures the feeling of being on the edge of an infinite space, with the power to launch yourself through it, but serious and significant uncertainty as to the consequences of doing so. The outline of a person on the left panel is my shadow. This photo is for the Bone Poets. 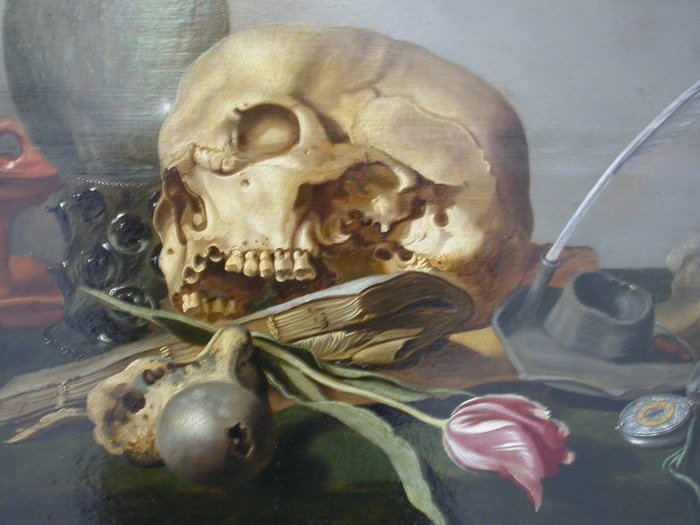 Vanitas by Pieter Claesz of Haarlem, 1630. (The whole painting, complete with glare, is here).